Redoubt Mountain Lodge is exclusively located on the glacier-fed waters of Crescent Lake in the heart of the Chigmit Mountains. Named for the 10,197 foot peak, Redoubt Volcano, in clear view only 8 miles away. Being the only lodge and privately owned property within a 25-mile radius, the lodge offers a truly remote Alaskan experience. As a guest you enjoy beautiful scenery, amazing wildlife and unforgettable adventures will fill each day. With a wide variety of activities including: hiking, kayaking, watersports, world-class fishing, photography bear viewing & exploring the surrounding area. 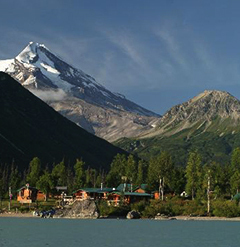 Whether searching for adventure or relaxation, the Redoubt Mountain Lodge accommodates any Alaskan vacation. Accommodation: Redoubt Mountain Lodge accommodates 12 overnight guests in 6 private log cabins. Each cabin includes: two comfortable beds, propane heating, shower/toilet/sink and views of the lake and mountains. Lodge amenities are more than comfortable with a screened-in gazebo hot tub, wood fired sauna, Internet connection, satellite TV & massage therapy available. Enjoy breathtaking views of Crescent Lake, Chigmit Mountains and to a beautiful hanging glacier. The authentic spruce log Main Lodge provides all the comforts of home. Three meals are served daily in the dining room of the lodge. A breakfast buffet greets guests each morning offering an assortment of homemade breads/muffins/pastries, fresh fruit & much more to start your day off right. A fully packed cooler is also provided for the day’s excursion. Around noon, guests return to the lodge to refuel & share the morning’s events over a full-plated lunch. Evenings provide a chance to wind-down while enjoying appetizers and complimentary variety of wine & beer; including Alaskan Amber on tap. For dinner, appetizing Alaskan entrees include Sugar Spiced Cedar planked | Salmon, Rib-eye Steak, Baby Back Ribs and many other delectable meals. Remember there is always dessert! Redoubt Mountain Lodge serves delicious food for the ultimate Alaskan dining experience. To put it plainly, if you are in search of incredible Bear Viewing Redoubt Mountain Lodge is the place to go. The parkland surrounding the lodge is home to Alaskan Brown and Black Bears and is regarded as some of the best Bear Viewing in the state. Watch these amazing animals in their natural habitat, feasting on spawning salmon and tending to their cubs. 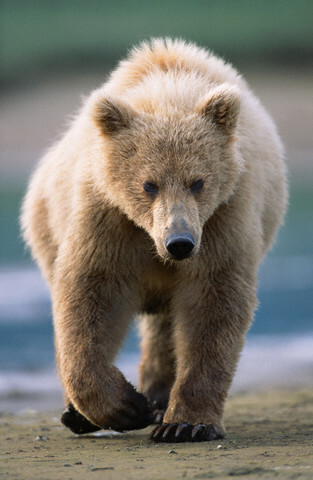 Alaska contains more than 98 percent of the US population of Brown Bears. 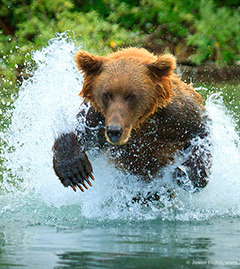 The term “brown bear” is commonly used to refer to the members of this species found in coastal areas where salmon is the primary food source. Brown bears found inland and in northern habitats are often called “grizzlies.”Redoubt Mountain Lodge prides itself on providing a phenomenal bear viewing experience for each guest. Our bear viewing is done primarily from the safety of a boat allowing us to cover a wide area and view numerous bears throughout a single day. Rest assured you will be viewing these bears up close. For our photographer enthusiasts, we utilize a flat bottom river boat which is ideal for setting up a tripod and quietly accessing some very shallow water areas to capture the bears feeding. This boat has proved to be ideal for catering to our photography workshop guests! Fully covered pontoon boats are also available to keep your equipment dry when that weather is less than perfect. In addition to motorized boats, we have a fleet of single and double person kayaks available to paddle along the lake shore viewing bears and wildlife. Nothing but the sounds of your paddle breaking the water & waterfalls in the distance, this is a MUST DO ! Located in southwestern Alaska, Brooks Falls is one of the best places in the world to observe brown bears. The bears and humans have been peacefully coexisting at Brooks Camp for over 30 years. There are three viewing stands set up for viewing the bears while they fish for salmon at the Brooks waterfall. However, you commonly run into bears on the trails to the observing stands and campground. The bears have learned that they can trust humans in Katmai so they pretty much pay no attention to humans and simply go about their business of non-stop eating. Katmai has the largest concentration of protected brown bears in the world and there are roughly 2,000 brown bears in the 3.6 million acre park. Unlike many other bear viewing locations in the world, the bears at Brooks Camp are protected from the grossness of sport hunters so most are not scared of humans. They are not aggressive to humans either. Brooks Camp is one of the finest examples in the world of peaceful human- and animal coexistence. It has almost a utopian feel to it. It's such a fun and exciting place to be with everyone excited about bears. The lodge has a bar, excellent food, and an indoor fire that people sit around while talking about bears and photography. Best time to visit is in July or early September. Overall, the world can learn a lot from Brooks and the national park service does an excellent job managing the camp. From Anchorage, scheduled jets fly the 290 miles to King Salmon, park headquarters; from there, June to mid-September, daily floatplanes fly the last 33 miles to Brooks Camp, site of a summer visitor center and the center of activity. Air charters can be arranged into other areas. You can drive the 9 miles from King Salmon to Lake Camp, at the western end of the park on the Naknek River, then go by boat to Brooks Camp, the Bay of Islands, and other areas of Naknek Lake. June to early September. Only then, with transportation from between Brooks Camp and the Valley of Ten Thousand Smokes, are the lodges, cabins, and Brooks Camp Campground open. Bear watching, an increasingly popular pastime, is best in July when the sockeye salmon spawn (bear watching suffers a brief lull in June and again in August). Fishing and hiking are good throughout summer, but come prepared for rain. Heavy snowpack may remain in the upper elevations into July. Summer daytime temperatures range from the mid-50s to mid-60s; the average low is 44°F. If your time is short, get to Brooks Camp. People, fish, bears, boats, and planes concentrate here. Compared to the rest of the park, it's crowded. But the lodge and campground are comfortable (reservations required) and the bear viewing unforgettable. You'll find good hiking and fishing. If at all possible, take the bus or van tour 23 miles out from Brooks Camp to the Valley of Ten Thousand Smokes. Return the same day or hike into the valley and camp. You can extend your stay by boating or flying to the many other lakes, streams, rivers, and lodges in the park. Pick your area, make a safe plan, and go. A trail from Brooks River Lodge, about a quarter mile long, leads to a floating bridge across the Brooks River. After crossing the river, an elevated viewing stand is available for watching bears in this popular area where the river empties into Naknek Lake. Bears often approach the bridge from both land and water. If it appears that a single bear will approach within 50 yards, or a sow with cubs within 100 yards, a ranger stationed on the viewing stand will direct everyone to get off the bridge and onto the viewing stand, or to return to the trail to the lodge. Another ranger is normally stationed on the trail to prevent people from the lodge walking to the bridge when a bear is present. The gates at each end of the bridge do not keep adult bears off the bridge, but probably do keep small cubs from getting separated from their moms. A smaller gate is at the viewing stand entrance. The bridge area of the river is a popular fishing spot, and many large salmon are caught there daily. The fishermen must also move to the viewing stand if a bear approaches. If a fish is hooked and a bear approaches, the angler must break their line immediately and not land the fish. The bridge is a popular place to watch the salmon swim through the shallow water. About 200 meters beyond the Riffle platform is the Falls viewing platform. This platform is often crowded, as shown here, and a ranger will limit the time an individual spends on the platform to about an hour during the crowded times. Crowding starts about 10 AM, and ends at mid afternoon. Each morning several floatplanes arrive with visitors that make a mid-day visit and then leave. I am guessing that 20 to 30 of these mid-day visitors arrive each day, but there could be more. About 15 people can comfortably watch bears at one time from the two levels of the Falls platform. About 20 people make it crowded. There is a covered seating area where the Riffle platform walkway joins the Falls walkway where bear watchers can wait a turn on the Falls platform. There are no toilet facilities except at the lodge. Meals are rather expensive at Brooks Lodge: Breakfast $17.00, Lunch $22.00, Dinner $35.00 (based on 2014 Information) Outdoor Clothing: Warm Jacket or Sweater, Personal Items, Walking Shoes or Boots, Sunglasses, Raincoat, Camera & Memory Cards, Long Sleeve Shirts, Mosquito Repellent should be kept with Scarf, Hat or Cap during your travel. The atmosphere at the lodge is casual, so bring comfortable medium weight sport clothes. By dressing in layers, you can add or subtract clothing and be comfortable regardless of the whim of the weather. Internet services are not available at the lodge. Trading Post Shop: The trading post offers a variety of items to purchase. Candy, freeze dried foods, soft drinks, and other snack items (trail mix, beef jerky, etc.). Personal items such as: Toothpaste, insect repellent, soap, film (no memory cards available), batteries and tobacco. Fishing items such as Line, leader, lures, flies and Alaska fishing license. You may also rent: Rods & reels, chest waders, canoes, kayaks, single burner stoves, bear resistant containers and showers and towels (for campers). Be prepared for stormy weather and sometimes sunshine. Summer daytime temperatures range from about mid- 50's to mid-60's degree F; the average low is 44. Strong winds and sudden gusts frequently sweep the area. Skies are clear about 20% of the summer. Light rain can last for days.